Great War at Sea: Jutland has a lot more going for it other than its coverage of one of history’s best-known naval battles. Along with the British-German struggle for the North Sea, there’s also the complete order of battle for the Russian Baltic Fleet and scenarios based on all of its major operations. When war broke out in 1914 Russia’s Navy was still rebuilding from the disastrous war with Japan a decade earlier. The Baltic Fleet had sailed around the world to be almost annihilated in the Battle of Tsushima. Only a handful of ships returned afterward, including just one battleship. But the survivors brought a wealth of experience back with them, and the Baltic fleet learned that minelaying and minesweeping would be far more important than clashes between battleships. The fleet’s cruiser brigades undertook repeated operations deep into parts of the Baltic Sea the Germans considered their own, leaving minefields behind them. Several of these cruisers were veterans of the Russo-Japanese War; others were sisters of ships lost in the Far East. Only one “modern” cruiser saw action in these raids. Yet despite the seeming obsolescence, the Russian cruisers proved highly effective, much more than their German opponents. 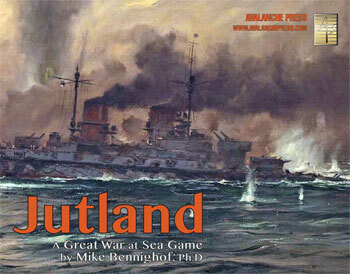 Here’s a look at these ships, as portrayed in our Jutland game. While the battleships swung at anchor in Reval and Helsinki, the Baltic Fleet’s cruiser brigades took the burden of repeated operations. This followed the practice of the Russo-Japanese War, and the Black Sea Fleet deployed its cruiser in similar fashion. None of the fleet’s armored cruisers survived to fly the Bolshevik banner: one was lost to a German submarine, while the rest had been worn out by heavy use. The most modern of the armored cruisers, Rurik, was ordered from Vickers in England to bring cutting-edge design and building techniques to Russia. She’s usually considered the best armored cruiser ever built, and the Navy hoped to lay down a series of sisters in Russian yards. But the battle cruiser Invincible was completed before Rurik, making her obsolete and infuriating the Russians, who believed they had been deliberately misled. They refused to accept her for months, finding a series of flaws in her hull and turrets, and took her into service only grudgingly. Rurik had a mixed battery of four 10-inch guns and eight 8-inch guns, plus 20 4.7-inch weapons. She’d been fitted with old-style reciprocating engines rather than the modern turbines that powered Invincible, and thus only made 21 knots. She could also lay mines, and despite her construction flaws saw extensive service as flagship of the cruiser brigade. Basil Zaharoff, a director at Vickers noted for his thick portfolio of shady arms deals, arranged the sale of Rurik the Russians, taking advantage of their eagerness to rebuild their fleet following its destruction by the Japanese. But the Tsar’s men wanted to hedge their bets, and ordered another armored cruiser in France, this time to a well-proven design. The Russians liked the design of their cruiser Bayan, built at the French yard of La Seyne in 1900. She gave good service during the Russo-Japanese War, and was sunk during the siege of Port Arthur. The Japanese raised her hulk and repaired her for their own use, but the Russians decided to order a copy from La Seyne and build two more examples in their own yards. Thanks to the proven design, the ships met their specifications — but naval technology had probably moved past them by the time they were laid down in August 1905, and definitely had done so when they commissioned in 1908 for the French-built ship and 1911 for her Russian-built sisters. They could make 21 knots and carried two 8-inch guns and eight 6-inch guns — fine qualities in 1900, but totally unsuited for frontline duty in 1914. Yet they served very well, as the German battle cruisers that could have easily destroyed them stayed in the North Sea except on very rare occasions. Two older armored cruisers rounded out the brigade, both of them veterans of hard service in the Russo-Japanese War. Rossia, a poorly designed ship commissioned in 1897, carried four 8-inch and a staggering 22 6-inch guns. Her near-sister, Gromoboi, commissioned three years later. Both were fitted as minelayers, and just as in the Russo-Japanese War they undertook repeated minelaying and commerce raiding missions deep into the Baltic Sea during the opening year of the First World War. Heavily worn by the war’s end, the new Soviet government sold them to a German firm for scrapping in 1922. Several smaller cruisers also saw service in the Baltic Fleet. Bogatyr, built by the German Vulkan yard, and her Russian-built sister Oleg were protected cruisers not much smaller than the armored cruisers, and also veterans of the Russo-Japanese War. Both began the war with a dozen 6-inch guns, with four mounted in turrets (one twin turret fore and aft) and the remainder in armored casemates. They had good protection for their type, and were considered quite fast when completed, making 23 knots. Both entered the yards in 1916 to have their armament replaced by sixteen much more modern 5.1-inch guns, but neither had completed their rebuilding when the Russian Revolution put and end to such efforts. Afterward Oleg was sunk by a British motor torpedo boat while in Bolshevik service, while Bogatyr survived the Civil War to be scrapped immediately afterward. Two other cruisers, about the same size and built at the same time to a Russian design, proved far less useful — but one of them would outlast all other ships in the Baltic Fleet. Aurora and Diana went to the Far East with the Russian Baltic Fleet in 1904 and survived to return to the Baltic. At 6,700 tons displacement they were about the same size as Bogatyr and carried eight 6-inch guns, but had a top speed even when new of only 19 knots. Remaining in port for most of the war, they were also receiving new 5.1-inch guns when the Revolution broke out, in which Aurora gained immortality by firing the shots that signaled the Communist uprising. Diana would be scrapped in 1922, while Aurora remains in St. Petersburg as a memorial to the October Revolution. Lacking modern light cruisers to scout for its new battle fleet, the Russian Navy ordered a quartet of fast, powerful ships for the Baltic Fleet in 1913 and eventually four more near-sisters for the Black Sea. Originally the Svetlana class would have been very large cruisers, pretty much miniature versions of the Borodino class battle cruisers of the same program, with a dozen 6-inch guns in four triple turrets. The incredible costs of the battle cruisers led to a reduction in the size of the 10,000-ton light cruisers to 6500-ton ships with a much more conventional armament of a dozen 5.1-inch guns in shields. The designers managed to increase this to 15 guns by dropping the speed requirement from 30 to 29.5 knots. Unusual for the time, a seaplane would also have been carried. The first pair were laid down in July 1913 in Reval, with their two sisters following in November in St. Petersburg. One, Svetlana, was launched in late 1915 and the other three in 1916, but none had been completed when the revolutions brought a chaotic end to shipbuilding in 1917. Svetlana herself would be evacuated to Kronstadt and eventually completed by the Bolsheviks after the war as Profintern; she transferred to the Black Sea Fleet in 1930. Renamed Krasny Krim in 1939, she survived the Great Patriotic War and was eventually decommissioned in 1958. Though some sources claim she was scrapped afterward, her hulk apparently still exists in Poti. Two of her sisters were completed as merchant ships (German submarine depredations caused a world-wide shipping shortage in the years following the Great War), while the fourth unit was scrapped. No other modern light cruisers were built for the Baltic Fleet; in 1915 a set of four fast minelaying cruisers very similar to the German Bremse was authorized, but no work began. Whether the Russians had knowledge of the German plans or simply drew the same conclusions from the experience of war in the Baltic isn’t clear, but they would have been very useful ships and likely forced the Germans to commit a large number oftheir own modern cruisers to the Baltic to protect the vital ore shipments from Sweden. While not a large force, or a modern one, the Russian cruisers were very effective, as shown in Jutland’s Baltic scenarios. Next we’ll take a look at the less active, but much more impressive, battleships and battle cruisers of the Russian Baltic Fleet. Add these ships to your toybox! Click here to order GWAS: Jutland today!